Dr. Rich Mahogany has one more award for his office wall. 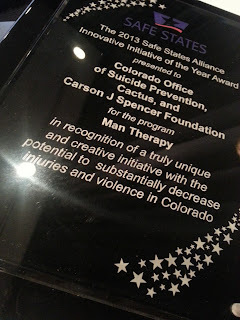 The fictional therapist from ManTherapy.org was selected by injury and violence prevention professionals around the nation as the winner of the Safe States Alliance Innovative Initiative of the Year Award! Congratulations are in order for Colorado's Office of Suicide Prevention, Carson J Spencer Foundation, and Cactus Marketing!